A family of robins made Terrance their home. They built their shelter in his protective arms and nested behind his leaves. Their nest is tinged with white, as they used Jackson’s shedding hair to help build their abode. Tonight, as the sun is going to bed, mama is standing there on top of Terrance, watching and protecting, while baby is safe and secure. You are an amazing photographer. I’ve never actually seen a robin. I don’t think we have them here in smogsville. Beautiful picture, and sweet caption. A very lovely picture. And story. We have lots of robins here. They usually spend winters with us. All over the yard. I like the robins. They’re really talkative. yes they are a chatty bunch. What a beautiful blue! Electric! It must be the shading. The robin is gray with a red breast but it does look blue doesn’t it. Call me naive but I didn’t know Robins came in blue! The only Robins I’ve ever seen are red-breasted. This little guy is gorgeous! Linda, yes this bird is gray with a red breast. It’s the lighting that makes him look blue. Only you could make a robin blue – and beautifully so. Love…love…love the color of this gorgeous photo of a beautiful bird!!! And the fact that the birds used Jackson’s fur for their nest in the protection of Terrance!! We laughed at that too. We pluck jackson’s hair outside because there’s so much, but you should know that! 🙂 At night his hair is taken away by the birds and in the morning it’s gone. Yup, yup, yup!! Could make a fur coat out of our Crazy Siberian’s shedding!! And the birds here love it, too!! How cute that they used Jackson’s hair for the nest. Very resourceful . See I would have chose red and missed this shot! Great Pic! Thank your for sharing one of the real touching moments in life. Did you know that the bird you call a robin in the US is different to our European robin. I believe the story is that the early settlers named it after they realised that our robin doesn’t exist on that side of the Pond. Our robin is a small brown bird with a bright red breast. Interesting. This robin is gray with a red breast. the lighting makes it look blue. 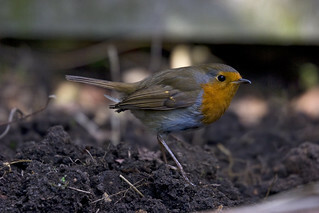 I’m not sure if this will work, but this is the European Robin. Close but not the same.. I can see that. Thanks so much. 🙂 Glad you like that. Ah! beautifully observed – thank you for a moment of magic! Do you suppose they will name one of the little ones after Jackson? Reblogged this on Daylight Photography. Blue robin what do you feel ? I didn’t even know robins came in blue. How beautiful! It’s just the lighting. No blue. Lol. No wonder I was so amazed. Sometimes I just scroll so fast through many blogs I follow I miss out on important info it seems. Thanks! Nice lighting on that robin. Thanks for the like of my “Signs of Things to Come”. Thanks for viewing. 🙂 ..